Bangkok annual Summer festival is back for 6 years in a row! A combination of Summer: Boardsport, Art, Fashion, Lifestyle, Quality food, Pool in the city and Party! Chill all day and Party all night long at 500sqm moveable massive pool. First time ever wakeboard show with light visual, starring: World Wakeboard champion “Daniel Grant”. Free Flowriding trial and Flowriding contest from Asian top riders. Tan Magazine will change A-Square carpark into beach lifestyle, with tons of activities in the middle of capital city!. 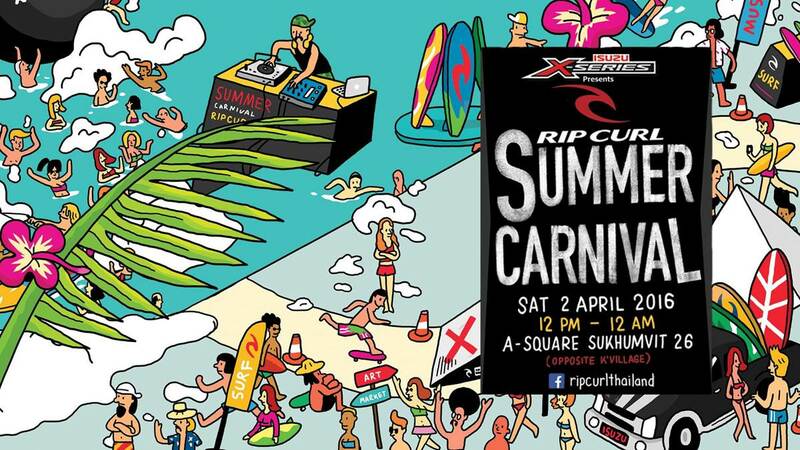 Get a chance to win 70,000 baht value of 3 x return ticket to Bali with 2 nights accomodations and RipCurl stuff. Searching for Artist who will be traveling to Art Basel with winner all over Asia. Quality food crafted by Thonglor famous chef, Ice cold Chang beer and Bucket of Absolut Vodka will be serve all day all night. Straight out of London and Brighton with the headliner..JACKBEATS and GOTSOME with 10 Bangkok all star DJs.